Belle is currently enrolled into a Bachelor Commerce, majoring in Accounting and Management. 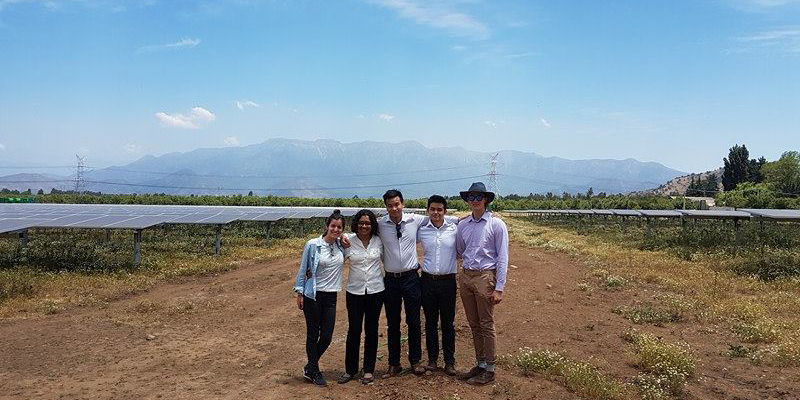 Her team worked at Pacific Hydro in Santiago, Chile. Belle was a recipient of the Global Management Consulting Prize for November 2017. The Faculty of Business and Economics awards a prize to the best overall performing student in the application and interview process. Why did you apply for Global Management Consulting (GMC)? I applied for GMC because I thought it would be a unique, once-in-a-lifetime experience. Honestly speaking, it was the best thing that I ever did and the subject exceeded my expectations. How have you changed after doing the GMC? Before I went on the GMC, I was hesitant when meeting new people and rarely tried to make new friends. The GMC gave me the opportunity to meet many people and form new friendships. The best part of the trip was being with so many amazing people from different backgrounds and becoming fast friends through the experience. After this experience, I intend to try to seek out new friends and be more open to meeting new people. Santiago is first and foremost a business center so most tourists go outside the city. However, I found the business center, El Golf, a beautiful place and the city is incredible because it is steeped in so much history. I enjoyed living there like a local would. I went into the GMC program expecting a difficult experience as none of my team spoke Spanish. This was not the case as English was widely spoken and staff at Pacific Hydro were friendly, receptive and ready to aid the team. Lourdes Oliva was the person overseeing the team’s project and working with her was a highlight in my experience. Lourdes had studied her Master degree in the University of Melbourne and we instantly connected to her. She had been working at Pacific Hydro for over a year and provided valuable guidance and encouragement to my team. My team were tasked with conducting a feasibility analysis on a solar plant and a sensitivity analysis on its variables. When I first received the project, I was unfamiliar with the terminology and unsure how to run a feasibility analysis. The project was challenging but we learnt on the job, received guidance and to our advantage, maintained a good client relationship throughout the project. During the project, we pushed ourselves to go beyond what was in the initial brief, to present a useful outcome to Pacific Hydro. Not only did we ascertain if the project was feasible, we took the next step of exploring how the project could become feasible. Pacific Hydro provided positive feedback and took a keen interest in our findings. I felt extremely satisfied with what my team collectively achieved. I loved working with my team members. We learnt many important lessons together, including the virtue of learning from our mistakes. Every member had individual strengths and divided tasks accordingly. There were tense moments but we managed to work through challenges by discussing problems and debating strategies to overcome them. We took care to refer to our client and ensure we were on the right track. The feedback at times required that we change large sections of completed work. This seemed disheartening at first but we discovered that the mistakes helped us learn and we worked better as the project progressed. The two weeks in Santiago were easily the best part of my university experience, despite the challenges. The experience gave me personal insights; I am interested in a career in consulting and would certainly consider returning to Santiago should future work opportunities arise. What were your team’s strengths? Want to participate in the Global Management Consulting? Learn more.